Shish-tauk sandwich & Lebanese music, Montreal-homemade style! Shish-tauk, an originally Turkish term and a Lebanese way of marinating and broiling chicken, enjoys much popularity and countless recipes on the internet. We in Montreal, though, would claim an exclusive right over this dish, as it is prepared in a specific ways by Lebanese chain fast food restaurants, most notably Amir Restaurant. 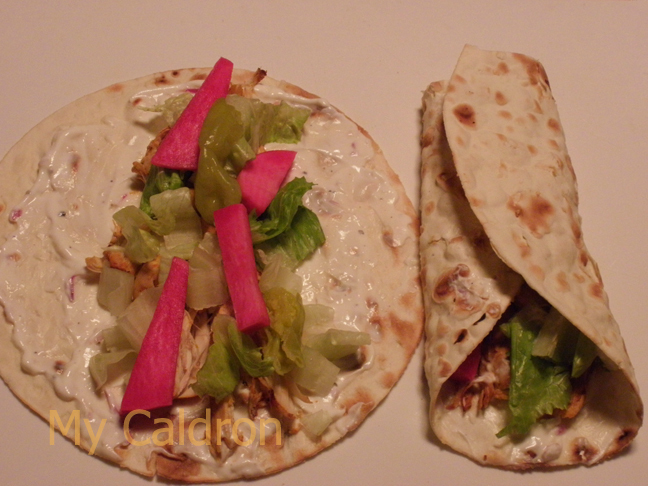 I have been to Amir and taken out its sandwich and plate shish-tauk dishes often enough to come up with my own recipes for this easy and delicious sandwich!